I was just reading a book called “Think and Grow Rich” by Napoleon Hill. You may have heard of it but if not, let me tell you a little about it. And why you should pay close attention to everything mentioned in it. … But I know that what I’m about to tell you is both fascinating and VERY effective, as I’ve used it myself and experienced the results. So if you want to truly feel what’s it like to unleash hidden genius within you, then pay very close attention to the technique I’ll give you in a few moments! The book “Think and Grow Rich” is not just a collection of personal opinions. The author Napoleon Hill went through a 20 year research period where he interviewed 500 of the richest and most powerful men on the planet. Out of this extensive research peering into the minds of the ultra successful, Napoleon summarized his discoveries into a number of success principles that work WITHOUT FAIL when applied correctly. In other words, the principles Napoleon Hill describes are NOT theory! They are proven ideas that the most successful people in the world agreed were crucial to succeeding in any field. Some of the principles in this book can be applied to the songwriting process. They can help you to be more creative, and in some cases, actually bring you face to face with your inner genius. There’s one principle in particular that is very interesting if you want to become one of those artists that write utterly inspiring music. In fact, Napoleon Hill believes that this idea is responsible for producing world class geniuses that far exceed the accomplishments of the average man. And in his book he lists many examples that prove this to be true. This technique in particular is a very important clue that will lead you towards very successful songwriting. So knowing that this idea is handing you a key to the genius inside you… would you like to know what it is? Napoleon discovered that if you put your mind into a certain “state” it opens you to what he calls “creative imagination”. Napoleon believes (and has a lot of research to back this up) that creative imagination is what separates the “geniuses” from the “average man”. And everyone has the ability to tap into their “creative imagination”. It’s just that not many people do because they aren’t aware of it and don’t know how to access it. He also believes that you can access your “creative imagination” by increasing the vibration of your thoughts. Now that may not sound too scientific, but what you need to remember is these ideas came from observations. So by taking in the big concepts here, and applying them (which I’ll give you a plan for in a moment) you’ll be able to reap the benefits. Ok, so what does this mean by saying it “increases your thought vibration”? Well, if you think back to important moments in your life where you feel a strong desire for something, you know what it’s like to experience this “increased thought vibration”. For example, one of the things that stimulates your mind in a way that “increases your thought vibration” is thinking about and feeling the emotion of love. Bring up these thoughts in your mind and allow the feelings that accompany these thoughts to flow through your body. And as you do this, realize that this is what Napoleon Hill means by, “raising the vibration of your thoughts”. And when you do this you are far more likely to tap into your creative imagination, which is where your inner genius lies. 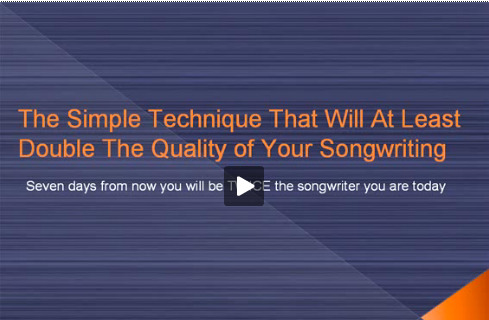 This will lead you to be very successful in your songwriting. In Think and Grow Rich Napoleon Hill states that increasing your thought vibration is the only way to tap into your creative faculties. And with the extensive research backing his words, I recommend you take this suggestion very seriously! Ok, so here are some of the “mind states” that will raise your thought vibration, therefore giving you access to your creative imagination – your inner genius. There are more of these “mind stimulants” that you can use to tap into your creative imagination also, but they don’t apply to music as well as what’s listed above. Ok, so how can you use this idea immediately to be more successful at songwriting? 1. Just before you are about to have a “creative session” on your instrument, or a lyric writing session, sit quietly and build an image in your mind using one of the “mind tools” in the list that I just mentioned. For example, use memories and fantasies to create a powerful feeling of love flowing through your body. Keep stimulating your mind with these thoughts until you can feel these emotions pulsing through your body. Another way you might stimulate your mind to increase your thought vibration is this: Sit with your eyes closed. Now, picture yourself up on a stage in front of thousands and thousands of people. They are all screaming for you. They are your fans, and they want you to deliver a performance that will stay with them for the rest of their lives. Playing with this image in your mind will fill you with DESIRE (If you have a desire to be a successful artist). And this desire will increase your thought vibrations and allow you to tap into your creative imagination. 2. Now that you’ve used one of the above “mind tools” to stimulate your mind, begin your songwriting session. And as you create, whether it be music or lyrics (or even both) try and keep this emotion, this desire running through you. You’ll find that doing this can be a very pleasurable session to say the least! Also, you will find that the results from this session will be VERY emotional, and VERY creative. In fact, when your mind is stimulated in this way, I’m fairly certain that you will cover some completely new territory in your session. This is my personal experience with the technique. DO make an effort to try this technique. It’s based on over 20 years of studying the worlds most powerful and successful people. And personally, I’ve found the results of doing this to be utterly inspiring. Try it - it's a vital key to successful songwriting.